Seattle has a rich history in the music world, so a unique facility of this kind is a natural fit. 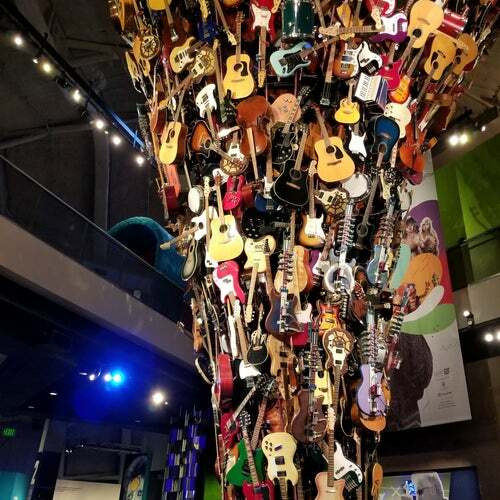 Permanent exhibitions include a guitar gallery and artists telling the stories behind the music. My advice would be to avoid this place like the plague. They rip you off with their prices, the exhibits are mediocre at best, and their gift shoppe selection is very sparse. If you end up getting hungry and want to go to their restaurant, then you have to go pay another entry fee of about $20/person. Then once you get inside the restaurant you have to deal with the over-cooked food that is insanely overpriced. A hamburger was about $13 and it had the consistency of a rubber tyre. The only thing that this place is is a waste of Seattle taxpayer&#039;s dollars by Paul Allen.